Esther Bomani submitted a business plan selling clothes imported from Mzuzu and Lilongwe. Instead of having a fixed premises Esther decided to sale her clothes on foot, the obvious advantages of this is her ability to meet a diverse range of consumers from multiple backgrounds. To date Esthers business has been a great success, unlike many businesses that we have invested in, this business operates under Credit basis. 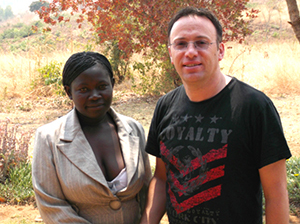 Customers are provided with the clothing and given two weeks to provide Esther with the cash for the clothes. Whilst this model can be very unreliable, particularly with food, Esther has the characteristics required in order to retrieve all of the payments that have been promised. She has so far been able to repay all loan repayments to date and is very happy and appreciative of the opportunity given to her by The Africa Trust.